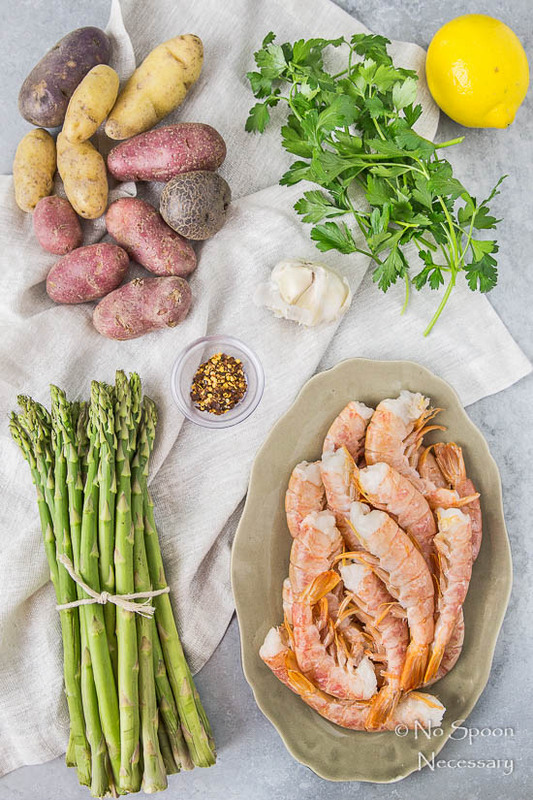 With zesty, lemony, garlicky, plump shrimp; crisp and tender asparagus, and crispy fingerling potatoes – this Sheet Pan Garlic & Lemon Shrimp dinner is not only a breeze to throw together, it is also seriously delicious! Well hello, friends! How was your weekend?! Did you get outside and enjoy the gorgeous weather? Maybe you got your grill on? Or was the weather still wonky and cold in your area like it was here? The weather sure has been weird this spring. I’d love to say our weekend was fantastic and we had so much fun on our vacation, but unfortunately it was postponed. Not the weekend (<–Obviously. Who postpones those things?! ), but the vacation. We woke up early Friday morning and I was like a kid in a candy store type of excited for the beach… until we checked the weather. The forecast predicted chilly rain all weekend long. Womp Womp. So, I’m heartbroken and still in desperate need of a dang vacation. Since my vacation dreams were shattered (for the time being), I haven’t been in the mood to fuss around in the kitchen. I am all about simply delicious meals at the moment. Easy meals that don’t sacrifice flavor are not only perfect for my current state, but they are also perfect for manic Mondays. 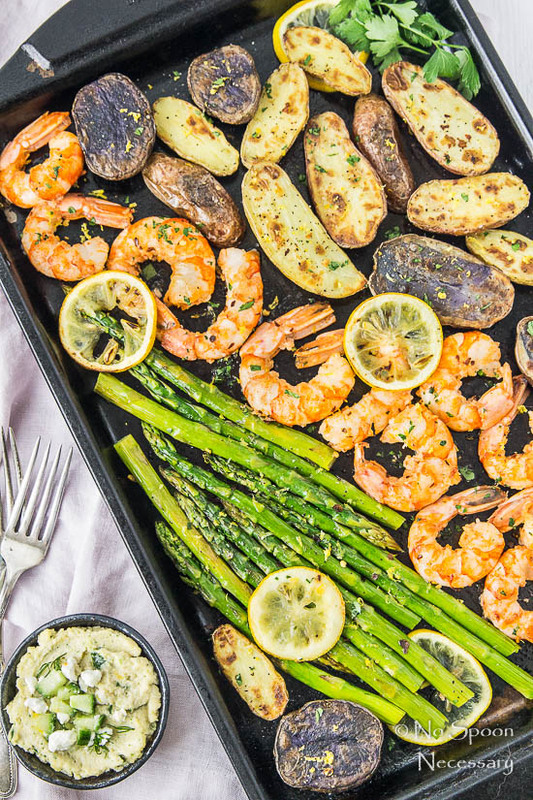 Therefore, a stress-free sheet pan dinner is what I’m sharing today. This sheet pan meal is not only stupid easy, it is also seriously delish. 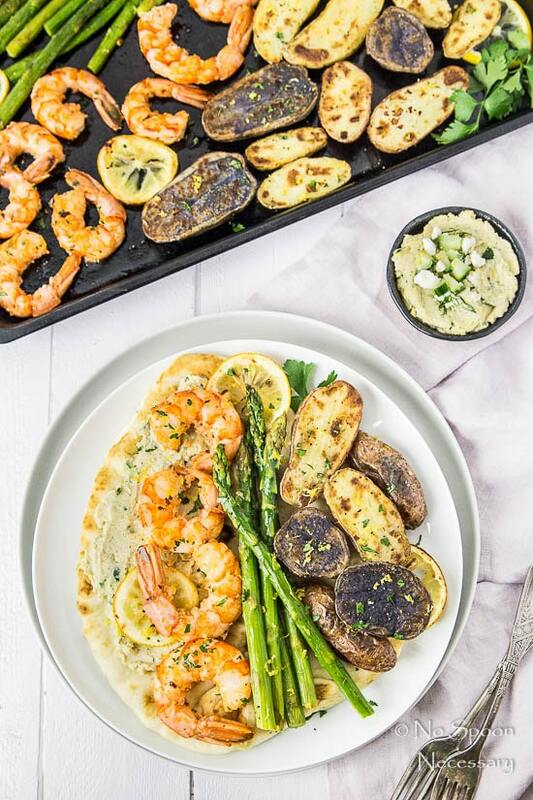 Zesty, lemony, garlicky, plump and succulent shrimp; fresh, crisp, tender asparagus and creamy on the inside, crispy on the outside fingerling potatoes – this sheet pan dinner celebrates springs bounty of deliciousness. I served this dish with tzatziki hummus and plenty of fresh naan bread, but you could absolutely just grab a fork (or shovel) and dive in. This is a judgement free zone, friends. 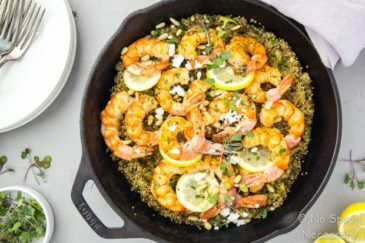 I used large, 16-18 count, shrimp in the recipe below. You can use smaller or larger shrimp if that is what you have on hand. You will just need to adjust the cooking time accordingly. 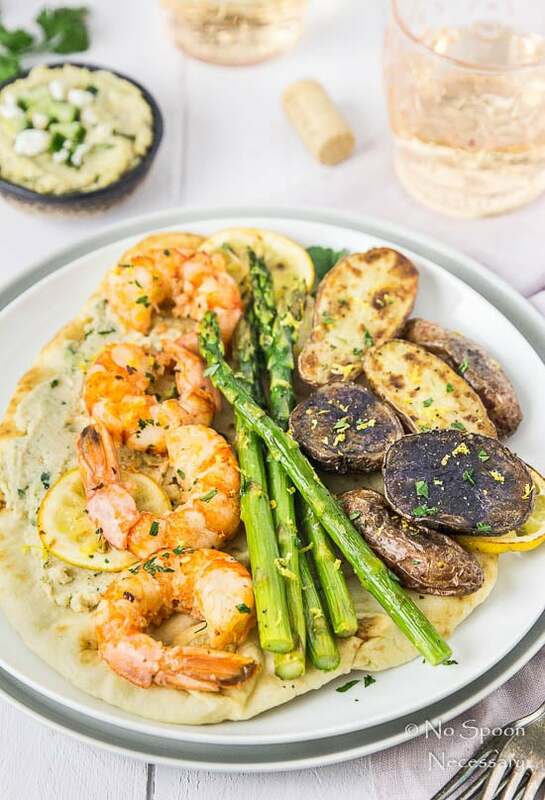 Do not add lemon juice to the bowl of shrimp, garlic and red pepper flakes until a few minutes before adding the shrimp to the baking sheet. 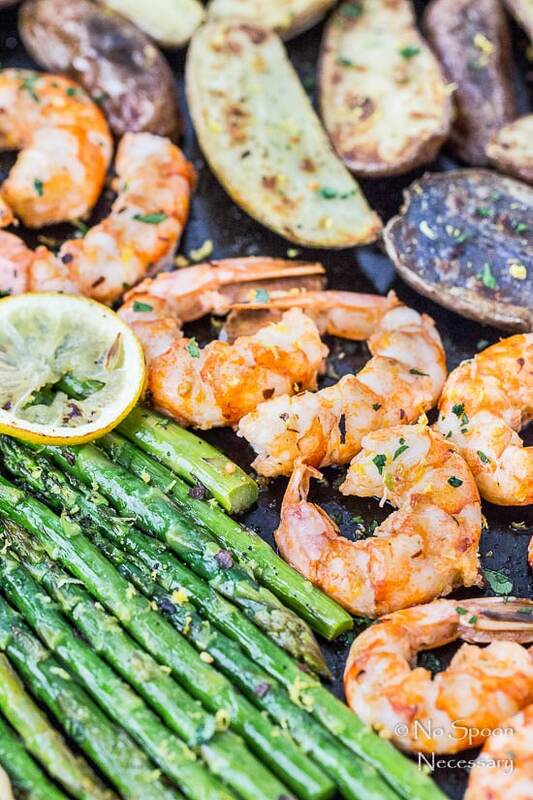 The acidity from the lemon juice will cook the shrimp if you let it sit too long. You just want the lemon to flavor the shrimp, you don’t want to make ceviche! 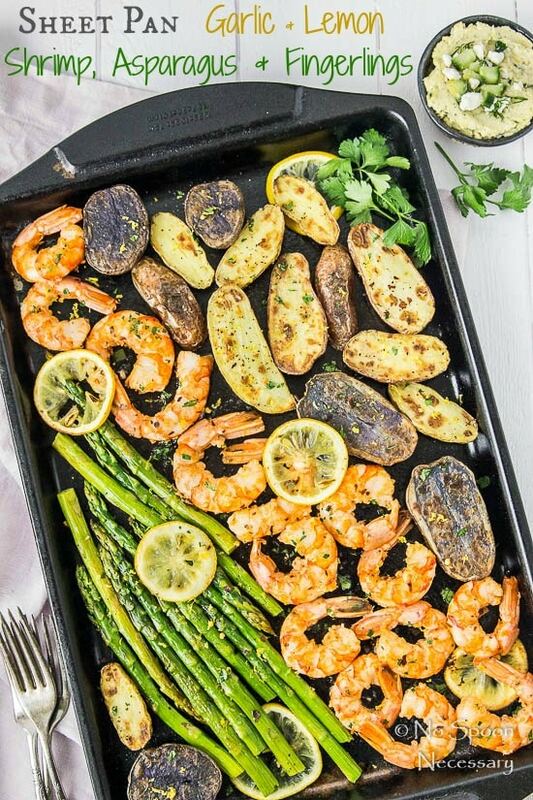 I used a large sheet pan and everything fit snugly once the shrimp were added, which is fine since the potatoes and asparagus were almost fully cooked. You can use two sheet pans if you do not have one large enough, just make sure you rotate the pans in the oven halfway through cooking. 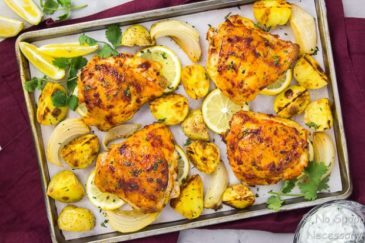 While not required, this sheet pan meal is SO good served with Tzatziki Hummus!! 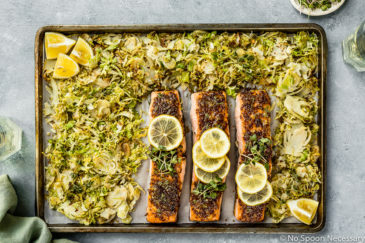 Add this easy-peasy sheet pan dinner to your busy work week rotation! Full of flavor and minus the fuss, this meal is sure to please! Until Wednesday** friends, Cheers – to stress-free meals! Preheat oven to 400 degrees F. Line a large, rimmed baking sheet* with aluminum foil for easy clean up. Place the shrimp in a large mixing bowl and drizzle with a 2 tablespoons of extra virgin olive oil. Add in garlic and crushed red pepper flakes. Stir to coat and set aside. In a medium sized mixing bowl, toss the potatoes with 1 tablespoon of oil. Season generously with salt and pepper. Transfer potatoes to baking sheet in a single layer. 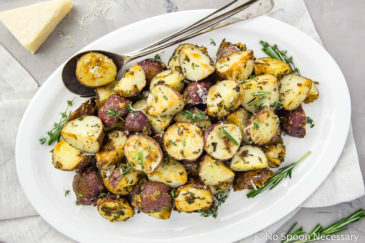 Roast potatoes for 20 minutes, or until almost tender. While potatoes are roasting, toss asparagus with ½ tablespoon of olive oil and season with salt and pepper. Set aside. Meanwhile, add 1 tablespoon of lemon juice to bowl of shrimp and toss to coat. Season shrimp generously with salt and pepper and toss again. Set aside. 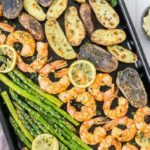 Remove potatoes from oven and add asparagus and lemon slices to baking sheet. Continue to roast for 10 minutes or until potatoes are almost tender. 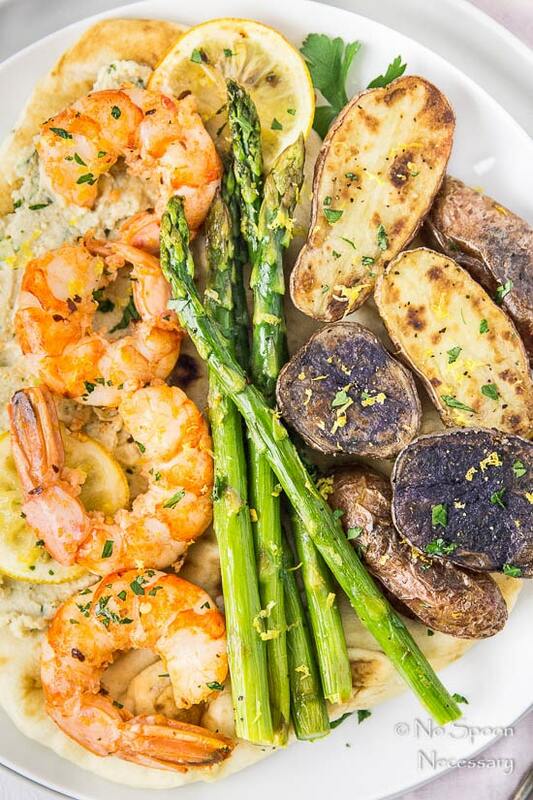 Use a slotted spoon to add shrimp to baking sheet and transfer back to the oven. Roast for 5-6 minutes or until shrimp are pink-opaque and firm to touch. 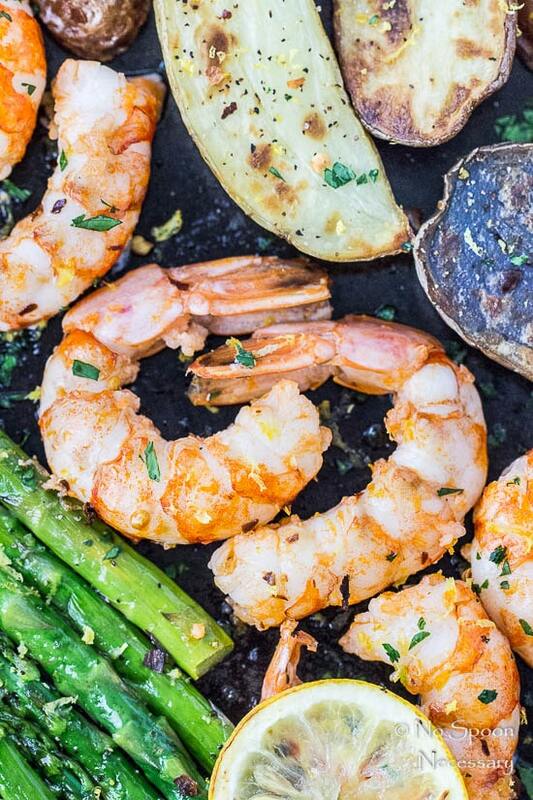 To Serve: Sprinkle lemon zest and parsley all over shrimp and vegetables. Optional, serve with Tzatziki-Hummus. **Nutritional Information does not include optional Tzatziki Hummus.